Larry Charles is a name not everyone may know off hand, but fans of comedy have almost certainly been shaped by his work in one way or another. Charles has worked as a writer, producer and director on some of the most infamous comedic movies and TV shows of all time, dating back to the late 80s. Now, he's back and stepping in front of the camera for his latest adventure. 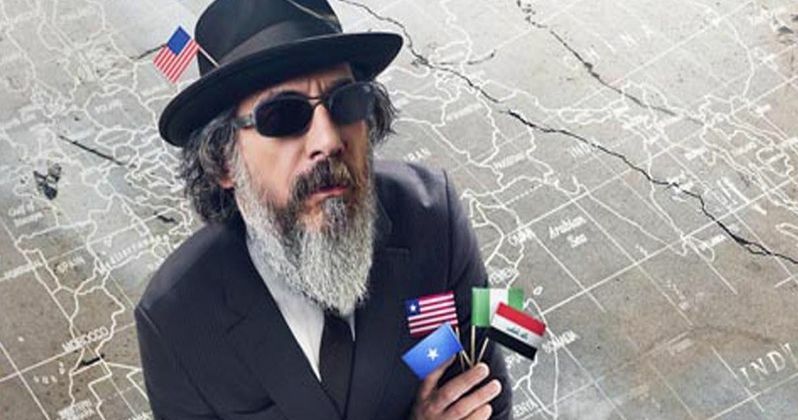 This time around, Larry Charles is the face of his new show, Dangerous World of Comedy, a new four-part, globetrotting series for Netflix that explores the deepest, darkest corners of comedy. Places most people would never think to look at, or even consider that comedy would exist in these places. Charles' career has been building up to this and it's made him, as he puts it, "uniquely qualified" to make this show. Larry Charles' Dangerous World of Comedy explores the vast depths and varying definitions of comedy in different cultures all around the world. The series explores places such as Russia, China, India, Iran, Nigeria Turkey and more. Charles travels to the unlikeliest of places and speaks to the unlikeliest of comedians to unearth just how dangerous and how meaningful the world of comedy can be. As a writer, Larry Charles got his start working on Fridays in the 80s, before moving on to The Arsenio Hall Show, which his where his work with icons truly begins. As a writer/producer, he's worked on certified classics such as Seinfeld, Mad About You and Curb Your Enthusiasm, cult classics like The Tick and Dilbert, and underseen gems like The Comedians. As a director, his collaborations with Sacha Baron Cohen on movies like Borat, Bruno and The Dictator have become truly memorable and influential. All of that really just scratches the surface. This is a man who has made a truly huge impact over the last several decades and, with his new interest in turning away from the major, traditional studio system in favor of doing new, exciting projects such as these, he's entering a new phase of his career. I recently had the pleasure of chatting with Larry Charles about Dangerous World of Comedy and a lot more. Without further adieu, here's the result of our chat. You've got a long, amazing resume in the world of comedy. What possessed you to not only do a docuseries like this, but one that really digs into these deep, deep corners that nobody would ever even think to look at? Where did this idea come from? Larry Charles: That's sort of my Raison d'être creatively. What can I do that no one else will do? That no one can do. What do I have the unique qualifications to make? This show seemed like a natural. The reason for that is it's the culmination of many different projects, many different, many different streams and many different concerns that I wanted to explore. I became very disenchanted, disillusioned with fictional filmmaking. There was just too many cooks and there was too much studio interference. Money was always an issue, and there is so much money wasted. I had no control over the end product. These last few times that I felt that was to the detriment of the finished product. So there was that. Then there was the fact that I had made Religulous, which was one of my best experiences. Very small crew. Totally non-fiction. Really flying by the seat of our pants, which is very similar to the way Borat was done also. I wanted to get back to that kind of filmmaking, rather than mainstream studio filmmaking, which is where I was. So that was a big part of it. Then also, as part of that, I traveled a lot the last decade or so to a lot of strange places, for movies, for commercials, for all kinds of things. What I found, no matter what country I went to, no matter how oppressive the regime was, there were always comedians there and I thought, "Wow. This is interesting." I get to create havoc and mayhem in these countries, then I get to come home to America. I have a beautiful life. I get accolades, I get rewards. With these guys, these men and women, have to stay in these countries with these oppressive regimes, trying to practice their comedy, and I thought, "What happens after I leave?" So that was a big driving force. I became very curious about that question. I started to just Google the craziest places on Earth, and comedy, and sure enough no matter what place I Googled, there were comedians there. I thought, "Wow. This is a show. This is a show that I am uniquely qualified to make." How did you end up at Netflix? Did you approach other, more traditional platforms? Or was this always a Netflix project? Larry Charles: Another aspect of this, I've been thinking about this for a couple years, then Trump became president. I was really distressed about that also, watching the way that he was running the country, that he was pushing us further and further into isolationism and judging and hating on all these other countries. I thought, here I am, just a regular person, what can I do to sort of combat that? Resist that. Expose people in this country to something they don't realize is true about other countries, that's also true about ourselves. That was another driving force, and so, once I had everything, all of the elements together, I actually went to see the Russo brothers [Joe and Anthony Russo] who I know, who were fans of mine, fortunately, as I am of them. They loved the idea and they have a production company. With their backing and their support, they felt, let's go to Netflix, Netflix is the place that will make this show, and that's how it worked out. The people at Netflix, it's a very young group of people. Very ethnically diverse. Just a really interesting, vibrant group of people, who essentially gave me complete autonomy to do this show, which is what I've been seeking. From beginning to end I had creative control over this project and that's why I stand behind it without any reservations. Part of that autonomy on this project for you, far more often you're behind the camera, be it as a writer, producer, director or whatever. But this required you to take a much more in front of the camera role, so it kind of rides or dies on your shoulders totally in that way. So what was that like? Larry Charles: Well, I wish I had been more vain, first of all. Tried to look a little better. I'm on camera, I'm in 126-degree weather in Iraq in a suit and I'm sweating like a pig. I had never thought about that part of it at all. I kind of saw myself as the Werner Herzog of comedy. He's kind of there, he's talking, sometimes you see him. I thought it would be nice to have my presence there to maintain authenticity. I'm not just recording this in a studio back in Los Angeles. I'm standing there doing this. I thought that would really lend a lot of credibility to it. Also, if we had a host, like an actual host person, it would kind of remove some of that reality. It makes it sort of a planned, less impromptu thing if there's a host involved and thought, even though I'm the host, I could also just drag everybody along and change things, or pivot. Shoot this, shoot that. So that's how it worked and it was kind of fun that way. We were able to be spontaneous. I'm not a professional by any means, but I've always loved comedy and I feel like so much good comedy comes from trying to make the best of a bad situation and this show feels like it takes that idea to the extreme. Was the idea kind of finding light in the darkest places? Larry Charles: One of the themes in all of my work is things that aren't funny that we make funny. I think a lot of the stuff I've done, from Seinfeld to Curb or Borat, are things that basically, ten degrees to the left and these would be very serious, grave issues, really. Ten degrees to the right, we find a way to satirize it and make fun of it, and have comedy at the expense of that target, whatever it might be. So that's one thing. The second thing I wanted to show, I didn't really think about this kind of healing, or this connective tissue between all comedy, everywhere. Between all cultures everywhere. Once I got to these countries, although there is a lot of satire in these countries, done at great risk to people's personal health, there's also a very strong strain of comedy, particularly in warzones, and it post-warzones, where people are trying to lighten the trauma, and the horror, and the atrocities of war. Use it more as a healing tool, as a survival tool. I was not expecting that to be as strong or as moving as it was to me. What I loved about this is I went in with a lot of assumptions and most of those assumptions were wrong. I love that sense of discovery, of not knowing and then finding out. Even as a journalist I've had that before, where you go into something and you think you know what you're getting into, and then you don't. Then that sense of discovery ends up being one of the most satisfying parts of the journey. Larry Charles: I think also, if I could just say, I think too, whether it's Borat or this, I think when you feel that exuberance as you're making the thing, that spills over into the thing itself. So, when the audiences watches it, I think in the case of Dangerous World of Comedy, I think when the audience watches it they will feel exactly what I was feeling. Which is, "Wow. I thought it was going to be this, but it's really that. Wow, this is much more moving than I thought it would be." I become kind of that vessel for some of those feelings, to kind of connect the audience to the show. Are there thoughts of maybe doing a second season? Or did you see this is a one-and-done sort of thing? Larry Charles: No. I think there are tremendous opportunities. Unfortunately, the world is so f****d up. There are all kinds of new dangerous places, constantly and there's always comedy there. For instance, we wanted to go to places that we couldn't fit into a budget and a schedule, very low-budget and a very tight schedule, so we had to kind of stick to a couple of continents. So, I think there's a lot of places that we did our research on and that we were prepared to go to and talk to comedians there. I didn't get to the Ukraine. I didn't get to Venezuela. I didn't get to China or India. So all of those places and more, they're all out there still, and they all have comedy scenes. I've already done research, even though that research continues to change. We were in Africa, we were in Western Africa, we were in Eastern Africa, and it was just too daunting to even get to South Africa from there. The continent is so large, it takes so long to get from one end to the other, we couldn't squeeze even South Africa into that trip to Africa. A lot of it has to do with the realities of our budget and schedule, which I wanted to keep as low and as tight as I could, but it prevented us from going any further than we went. It does give you guys somewhere to go in the future. You already have stuff laid out which, I would assume, would be a comfort from a creator's perspective. Larry Charles: It's a huge comfort to me. It will be up to them to decide whether or not they want to continue with it. You've worked with Sacha Baron Cohen a few times, you mentioned Borat and stuff. Have you guys had any talks about doing anything with each other again? Or are you guys sort of playing that by ear if something ever comes up? Larry Charles: I think the latter is probably more true. It's like being at war, really. We've had some very intense experiences together. Very high-tension experiences. A lot of stress. A lot of anxiety for many years, and sometimes when that happens you need a break. He's somebody that everyone wants to work with, and I have the good fortune of being able to work with a lot of people too, and I want to sort of pursue my path, and he's sort of pursuing his path. So yeah, I mean, look, who knows what the future holds? But there's no real plan right now to do anything together. You did the Dilbert show back in the day, which I loved. I feel like in the modern landscape that really has a place. Would you ever consider bringing that back as an animated show somewhere? Larry Charles: I'm open to all sorts of things. I worked on a show called The Tick also, which, people are constantly clamoring for The Tick. Although, that one, there's a new Tick on Amazon. I haven't seen that one, but The Tick we did with Patrick Warburton actually has a weird kind of cult following. So, I'm always open to continuing these shows. I'm not really interested in revisiting my past work. I'm really interested in moving forward. I love Dilbert. I love The Tick. I thought those were both really distinctive shows, and very relevant shows by the way. And Dilbert, you're right, would definitely work in the modern context, but the trick is, Scott Adams owns it, all of these different people own Dilbert. It's a very complicated process to get something made under those conditions. Maybe see what Netflix can do about that Dilbert reboot? For now, we have this and, with any luck, a second season of this show will eventually take us to new, unexplored corners of comedy around the globe. Larry Charles' Dangerous World of Comedy hits Netflix on February 15.